The U.S. Fish and Wildlife Service confirmed Wednesday that an Obama-era ban on elephant-hunting trophies from Zimbabwe and Zambia will be reversed. Trophies from elephants legally hunted in two African countries can now be brought back to the U.S. The U.S. Fish and Wildlife Service confirmed to several media outlets Wednesday that an Obama-era ban on elephant-hunting trophies from Zimbabwe and Zambia will be reversed. African elephants are listed as threatened under the Endangered Species Act. According to the World Wildlife Fund, the African elephant population plummeted from at least 3 million in the early part of the 20th century to about 415,000 today. 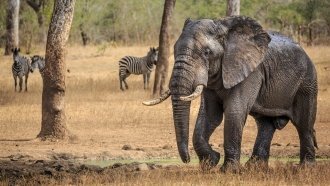 But the Fish and Wildlife Service said in a statement that hunting African elephants in Zimbabwe and Zambia could help conservation efforts by "providing incentives to local communities to conserve the species and by putting much-needed revenue back into conservation." The decision was cheered by some hunting and gun rights organizations, including trophy-hunting advocacy group Safari Club International. But animal rights advocates like the Humane Society of the United States slammed the move as jarring and absurd. Someone wishing to bring back an elephant trophy must apply for a permit. The policy applies to elephants hunted in Zimbabwe between Jan. 21, 2016, and Dec. 31, 2018. The same goes for elephants hunted in Zambia from 2016 to 2018.